In this tour, you will visit Hakkoda Ropeway & Nebuta Museum Warasse. Hakkoda Ropeway was established in October 1968. Mt. Hakkoda is filled with great many alpine plants in bloom. A 10 minute ride of Hakkoda Ropeway takes you to the Tamoyachi-dake Sancho Station for a panoramic view of the fresh greenery of early summer. The Nebuta Museum Warasse attempts to capture the spirit of the festival and gives visitors a taste of its lively atmosphere, history and traditions. Upon entering the second floor entrance to the exhibitions, visitors are presented with the sights of the festival along a red corridor lined with photos and images from the Nebuta Matsuri's 300 year history. Continuing further into the darkened main hall of the museum are five actual floats that were built for past festivals. Visitors can walk around the floats, which are changed out every year, and admire the craftsmanship that went into their construction. Several hands on and cutaway displays show the underlying structure of the floats while other exhibits show how the designs have evolved over time. • We leave the port behind us and head inland to reach the Hakkoda Mountains, a fascinating volcanic mountain range and popular destination for ski lovers in winter due to the abundant snow. 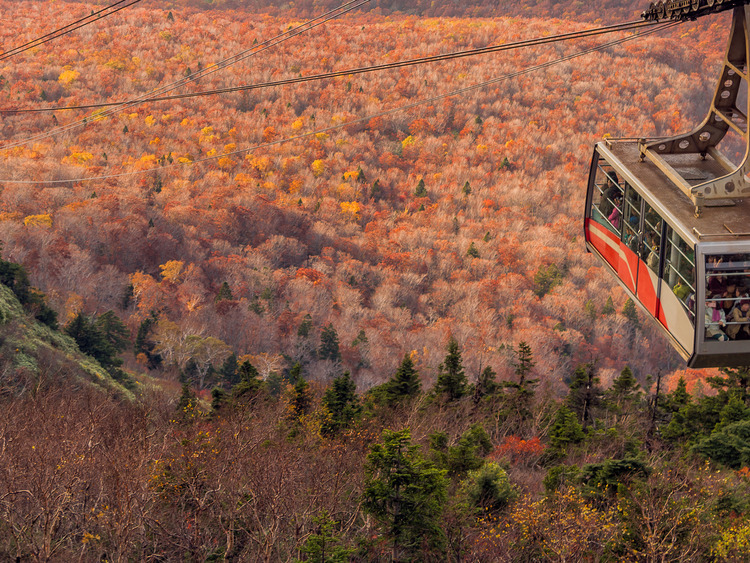 • We ride on the spectacular ropeway on mount Tamoyachidake which offers breathtaking picture-perfect views that change according to the season. • We then move on to the Nebuta Warasse museum dedicated to the famous Nebuta Matsuri festival held in early August involving a parade of evocative lit-up floats of gigantic proportions. • Located in a very modern building in the port area, the museum recreates the lively festival atmosphere with its unique setup: we walk along a red corridor covered in pictures illustrating the 300 year history of the event and enter the main hall illuminated by spectacular lit-up nebutas. We admire the large floats and learn all about the secrets of their construction thanks to specifically-created slits.